My vet had a poster up in his office with this hashtag #TooCuteThursday. I think it was advertising for a magazine but I knew instantly that it would be a blog post about our dogs, Truman and Wilson. Truman is a cavashon, a mix of a Bichon Frise and a King Charles Cavalier. He has a curly white coat with some brown patches on his back. Truman has a sweet disposition. He is a rescue dog, so he has some trust issues, even with his own dad! 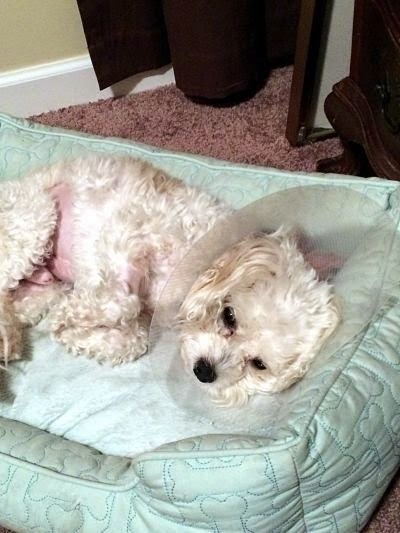 Recently Truman had to have surgery because stones were found in his bladder. They were too big to dissolve on his own with a change in diet. We saw them after surgery and they were flat, like a dime, although somewhat smaller than a dime. The vet said they were unusual, even for him, so he sent them in for analysis. We haven't heard back as of yet if there was anything to be concerned about. Truman is recovering nicely. The pain meds make him sleepy so he's been napping more than usual. He loves his new food, Royal Canine and eagerly goes to his food bowl. He has approximately a 4-5 inch incision that is held together with staples. That's why he is wearing the dreaded cone. I took this photo of him tonight. He looked so cute with his paws drawn up and his wide eyes. We are getting ready to go to bed and I think he is ready. Truman has another week with his staples and we see the vet on Friday to make sure he is healing well. I think he will have a good report!